Play Cabaret Royale Slot Online with 500 Free Spins! Cabaret Royale is a 5-reels, 60 paylines Online Slot Game by 2by2 Gaming. Feng Fu has Free Spins, Scatter symbols, and Wild features with an RTP of 96%. Enjoy the best seat in the house as Cabaret Royale online slot game puts you front and centre at a cabaret dance theatre show, where there are many chances to win real money on stage. Prepare yourself to be dazzled and immersed in an exciting dance performance in Cabaret Royale slot game, as you have front row seats in a classy theatre. Dark red curtain elegantly open to the lively reels, and even the ferns on either side are dolled up with sparkling lights. High to medium value symbols include a classy debutant dancer with bright jewelry and a red dress, the master showman, a candelabra chandelier, red high heel shoes, a pink perfume bottle, and a green top hat. There is a mask bonus symbol and also a Wild. Of lower value are standard playing card symbols of hearts, diamonds, clubs, and spades. The graphics are nicely illustrated in a bright and colourful style, and there are slight animations for the winning symbols such as the Wild symbol depicting a girl blowing kisses or the showman nodding. This also combines effectively with the bright and energetic sound effects that signal wins. The background music, however, is much more subdued and relaxing; a piano tune reminiscent of an old cabaret theatre. Swirl your top hat and peek inside as each spin of the reels of Cabaret Royale online slot at Rose Slots may have you pull out many exciting payouts. 2by2 Gaming is the online casino games developer that is giving you the exclusive tickets to Cabaret Royale slot. Based in Chicago, 2by2 Gaming has released numerous titles over the years that always impress with detailed visuals, exciting gameplay, and rewarding bonuses. Players of online casino UK can discover many other 2by2 Gaming creations at RoseSlots.com such as ‘The Sand Princess’, ‘Humpty Dumpty online casino’, and should also stay tuned for titles like ‘Agent Valkyrie’ and ‘Snow Queen Riches slot’. There is no chance of getting stage fright in Cabaret Royale online slot as gameplay is calm, easy to learn, and engaging. With 5 reels, 6 wager rows, and 60 paylines, there are plenty of dance moves that impress with many ways for major wins. The Wild replaces all other symbols, except the Scatter, to award winning combinations. When 5 of the Wild land on the reels, you will be feeling stylish with up to an exciting £1,200. The Wild can also appear as full stacks on reels 1 and 8 in the main game and be replicated from reels 2 to 7 when it does, increasing your chances of major wins. While 5 of the ravishing debutant on the reels will charm you with an up to £800 win, 6 of the Scatter offers an even more generous payout of £2,000 in addition to launching the Bonus Round. After any win of at least 5x your total bet, the Encore feature can occur that awards 2x the win amount. Betting in Cabaret Royale slot has a flexible range from 40p to £80. If it is rehearsal time behind the curtain, set the AutoPlay for 10 to 100 continuous spins and practice your high kick. If you want to speed up the show, there is a convenient QuickStop by re-pressing the spin button for a faster gameplay. You can even play Cabaret Royale online during intermission as it is beautifully designed and formatted as a mobile slot as well as on other devices like tablet and desktop. With many chances for major payouts in the main game and also an exciting Bonus, the theoretical RTP is estimated at 96.029%. 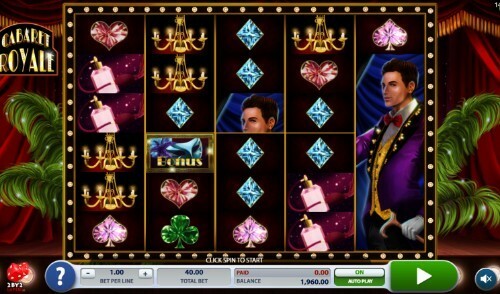 When 3, 4, 5, or 6, Scatters appear from reels 2 to 7, you will be awarded 8, 10, 12, or 15 Free Spins respectively. You then get to choose from 1 of 3 options: Free spins with a frequent Encore feature; with reel 1 and 8 frozen as stacked Wilds; or with frequent Wild and Encore feature. Even more exciting is the fact that an extra 3 or more Scatters on the reels will retrigger the Free Spins.